After yesterdays race report I got a couple of emails asking about race plans for the rest of the year. I'm currently in San Fransico at the Linux Summit, heading to Redmond for Microsoft later in the week and then Saturday back into full training, race prep' mode. I've sent a new shoe to Mark, who has taken over from the Wongstar as my magic running shoe builder, I'm not sure what's changed but my feet have been rubbing more around my toes lately even though my current shoe, Zoot Mens Energy 2.0 is identical model and size. I've sent Mark a pair of K-Swiss K-Ona S Mens, they have a much wider front. Getting the first pair of shoes heavily modified is always difficult since every shoe is constructed differently. The new shoe is on its way back I'll cover that in an upcoming blog. 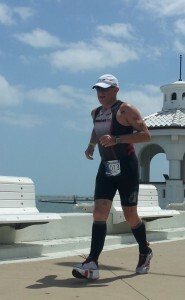 You can see my current built-up shoe in this picture(click to enlarge) taken by John Chung as I "ran" in on the last lap at Corpus. 4/27 HITS Marble Falls race; full ironman distance, but only the swim and the bike, maybe a short run. I'm sure I'll be doing other rides and runs, but with my A-races sensibly spaced out, it makes for another season of long training, after which I'm done with long course for at least the next couple of years. I've already declared an interest in doing the whole Texas Tri Series in 2014, with, of course, a view to a win. Here's to great health, and a long tri season. ILML.